I love the water. 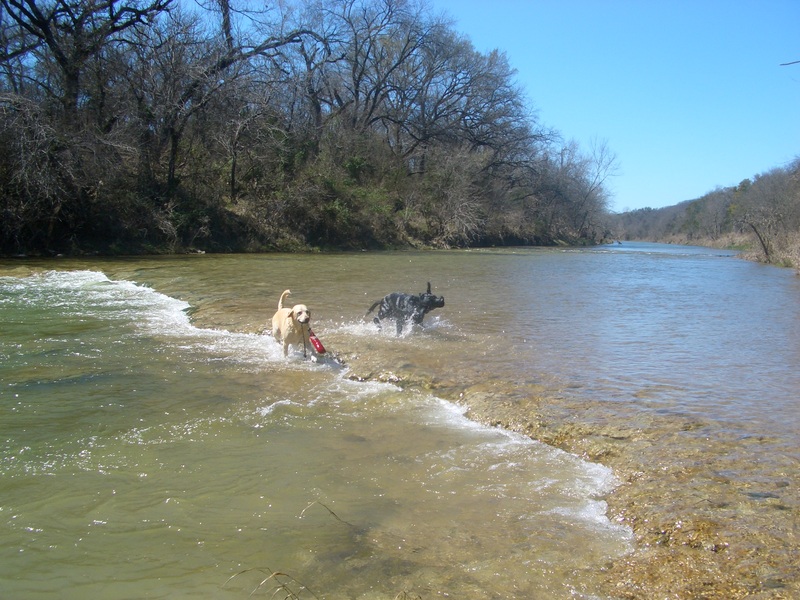 I love to splash in the pools in the river. I love to feel it raining down on me. I love to drink and slurp it. I love to shake it all over everything. Water is a precious thing. We live in a place that doesn’t get a whole lot of water raining down. We do happy dances when rain comes. Rain makes the river flow with JOY. Rain makes grass and flowers pop out all over. Rain means our well won’t run dry. Water is a very precious thing. My Mom Person worries when the rains don’t come. She worries when the river goes dry and the trees start to die. She worries when she passes by houses with sprinklers going. She likes living here at the 7 Acre Wood, but she likes the rains to come. Water conservation is a really important thing. Water is precious. I understand that there are some places in the world that have more water than they can deal with. 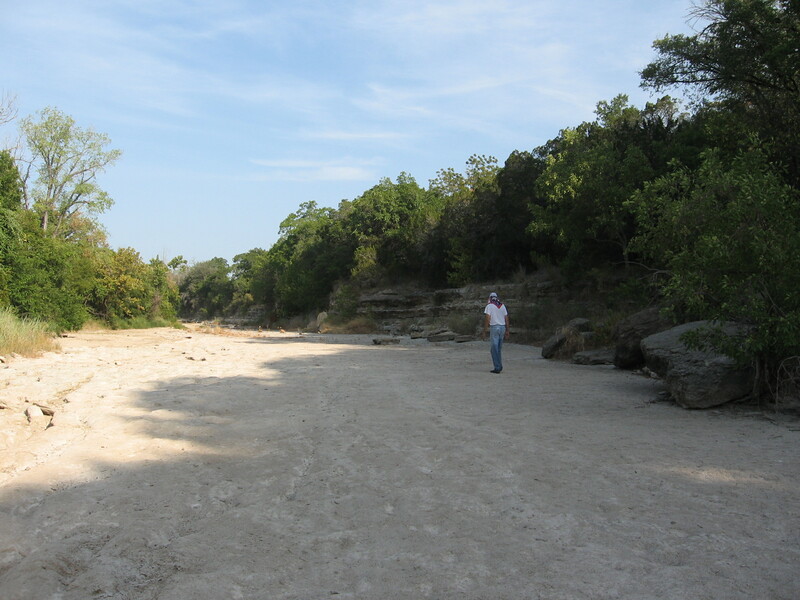 And there are some places that have less water than what we get here in Glen Rose, Texas. There are people in some parts of the world who don’t have clean water to drink and bathe in. That’s a sad thing. Water is sooooo precious. I have a book about water. 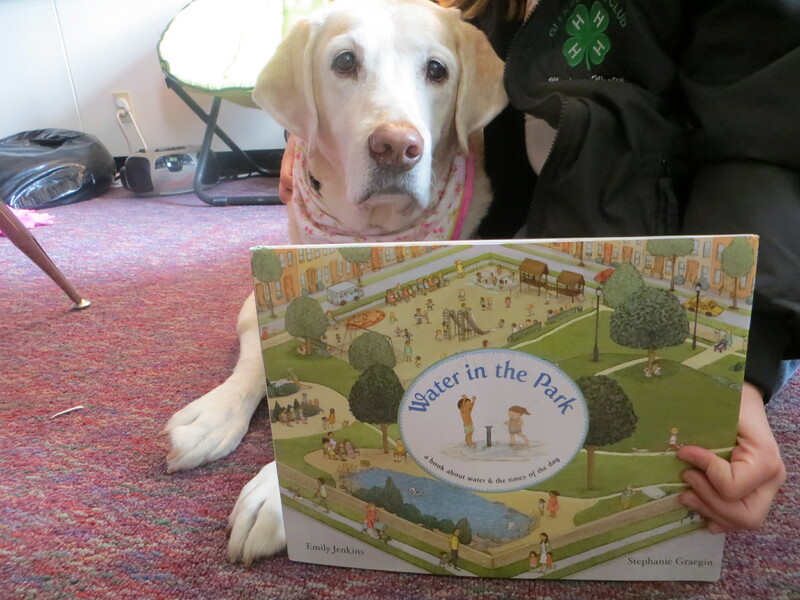 It’s a cute book about a summer day in the life of a city park where water is an important part of the daily cycle. This neighborhood seems to have plenty of water. The people here do not seem to worry about a lack of water. But the water in the park is precious to them nonetheless. The story begins in the early morning when the park is quiet and empty and the turtles come out of the pond to sun themselves on the rocks. Then the dog walkers come to let their dogs have a romp in the pond. 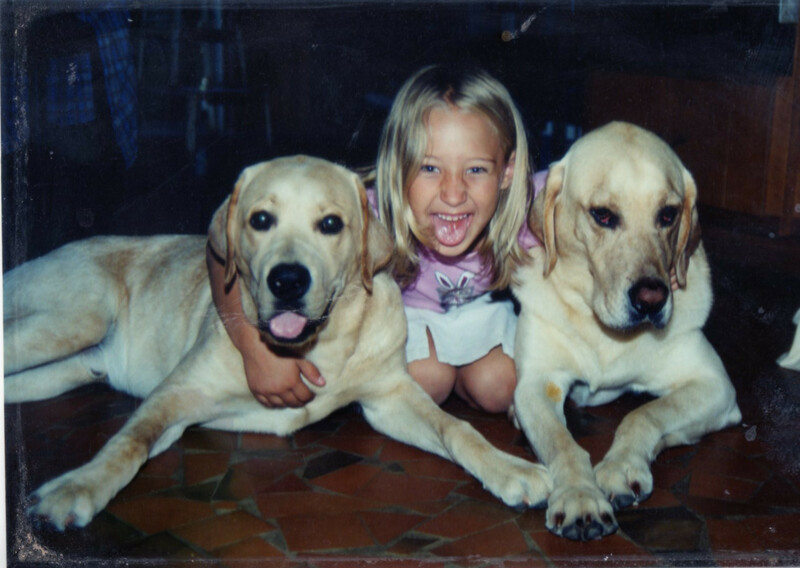 They are very lucky dogs!! As the day progresses the neighborhood awakens and more and more people come to enjoy the park. They play in the pond and the sprinkler pool. They drink from the water fountains. Kids fill water balloons and pour buckets of water in the sandbox. They pour water down the slide to cool it off. Birds and squirrels come to play and bathe in the water. Workers come to water the gardens. The pond and the fountains are a haven for everyone. At the end of the day the rains come. Everything in the park is now wet with glorious water. Water is a precious thing for sure!! I really liked this book. It’s not a conservation book. It’s kind of like you’re sitting on a park bench watching the day go by. But the day is filled with water. And I like a day filled with water. The illustrations are great with lots of details to catch the eye. I will be looking out for more books by both Ms Jenkins and Ms Graegin. There are quite a few organizations that work to provide clean drinking water for people around the world who are without this most precious commodity. Goodnet.org has a list of seven non-profit organizations that provide safe water solutions for developing countries. You can check out the list HERE. 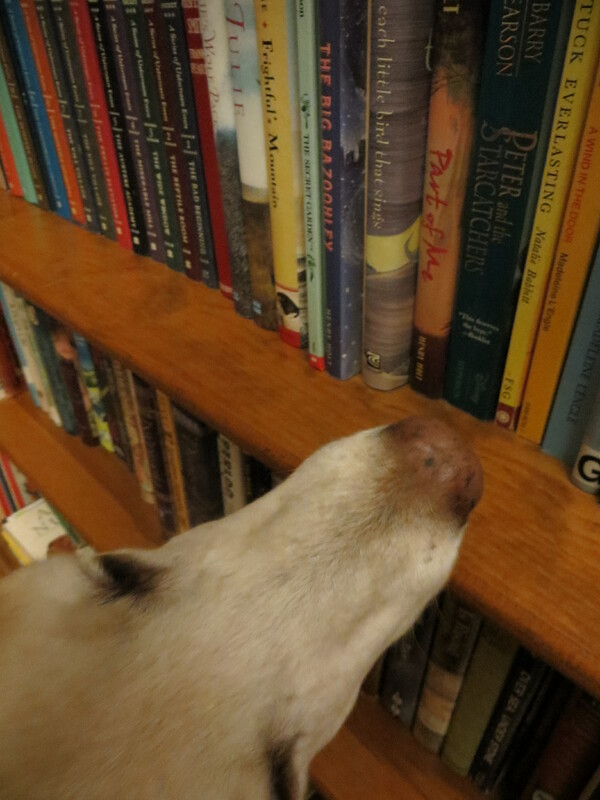 I am submitting this post to The Small Fry Safari Reading Challenge at The Bookshelf Gargoyle as an entry for Category # 6, A book with something PRECIOUS in the title. I recently did a post about a Listening Walk. What about a Water Walk? How far would you go for Water? You know how when you see someone smile, it makes you smile too? A smile or a good deed can travel far and wide. It can connect us to our neighbors and to others around the world. When my tail wags it starts all kinds of waves that connect me to everyone around. People and pets are all connected somehow, someway. 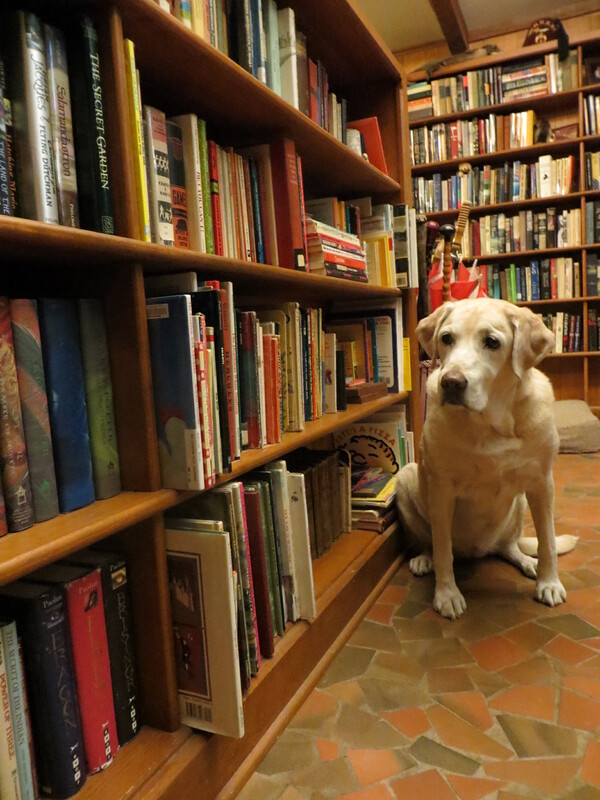 When a person tells a story about their dog, it makes you think of a story about your dog. And on and on. We’re all connected. Each one of us to our neighbor. And on and on. I think books are like that, too. All the books are somehow connected in a kind of web. A book web. Like when you find a book that you really like, you want to read more books by that author. 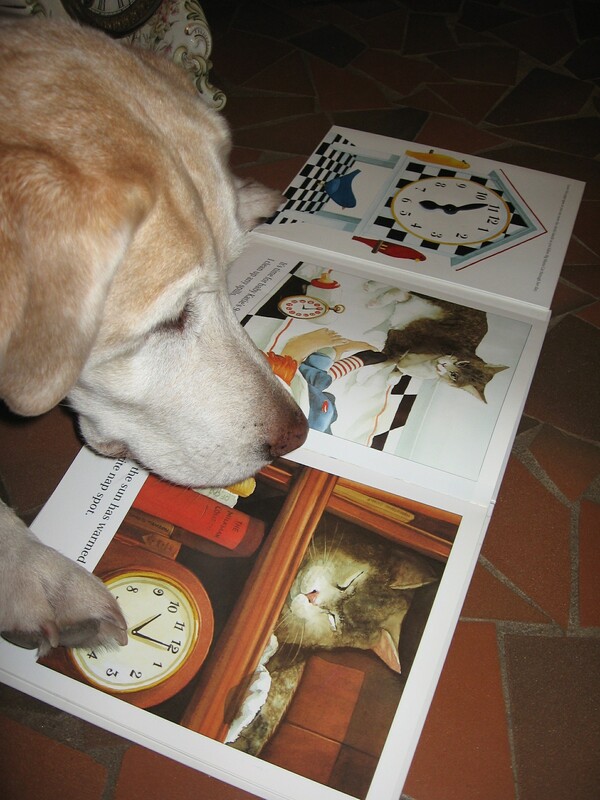 Or you want to find more books from the illustrator. Or more books on the same subject. And on and on. They’re all connected. Each one connected to its neighbor. This all comes to mind because this connectedness was set in motion the other day with a post that I did about a book called Mr Rabbit and the Lovely Present. This book was written by Charlotte Zolotow. When we were researching Ms Zolotow, we found that she has a daughter named Crescent Dragonwagon. A very unique name, right? A name that would be hard to forget. And I knew that I had heard that name before. And then I remembered a book that my girl, Brenna, had once read to me. A book that she really, really liked. So I went to the bookshelves and looked and looked at all the connected books. Books that were connected by Brenna. Books that she had read to me and that connected the two of us together. And I found it! 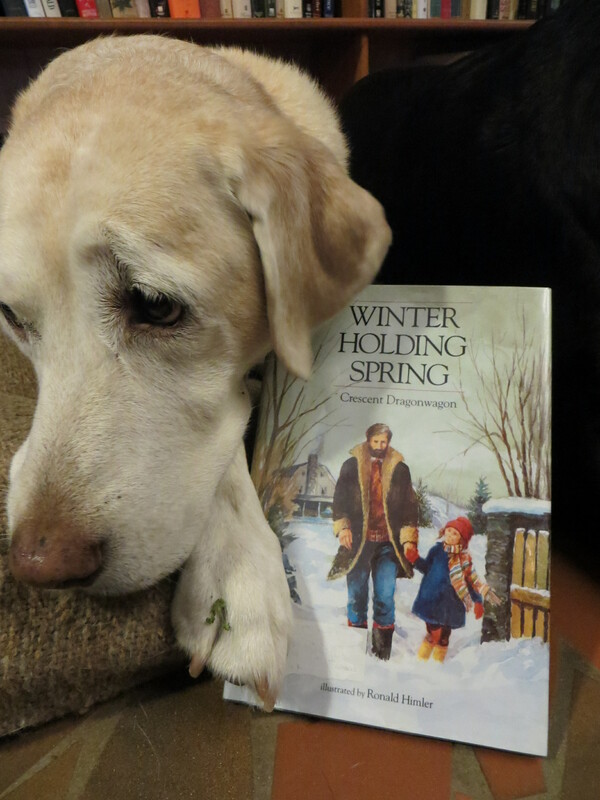 The book is Winter Holding Spring by Crescent Dragonwagon. It’s illustrated by Ronald Himler and was published in 1990 by Atheneum Books for Young Readers. The book itself is all about connections. It’s the story of a young girl, Sarah, whose mother died the previous year. She misses her mom and finds memories of her everywhere. She and her dad talk about the memories and the missing. And they talk about time and how time flows into itself. At the end of summer, you find bits of fall coming — a lone, yellow leaf falling down. At the end of fall, you find bits of winter coming — pumpkins waiting for pumpkin pie. At the end of winter, there are bits of spring — bulbs breaking thru the snow. And spring holds a whole lot of summer — seed catalogs, vacation plans. Each ending brings a new beginning. And fresh hope for a new way to look at the world, and at life, and at sorrow. This is a lovely, poetic book. My Brenna girl felt particularly connected to it because her mom had died as well. She knew just how Sarah in the book was feeling. And she listened to the words that Sarah’s Dad gave to Sarah. Brenna is a big girl now and lives far away so I don’t see her very often. But I sure do love it when she comes back to visit. 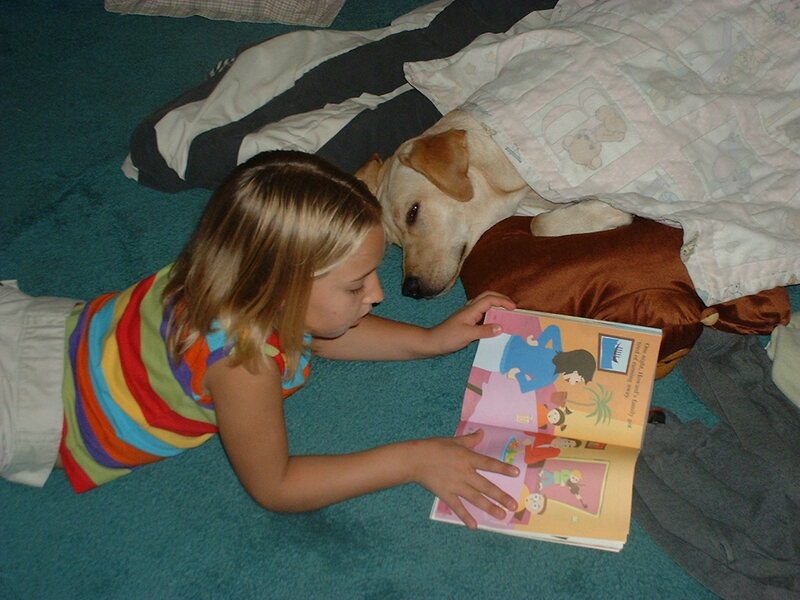 She still reads to me, but we haven’t thought about this book in a long time. That Mr Rabbit with the lovely present brought it all back. 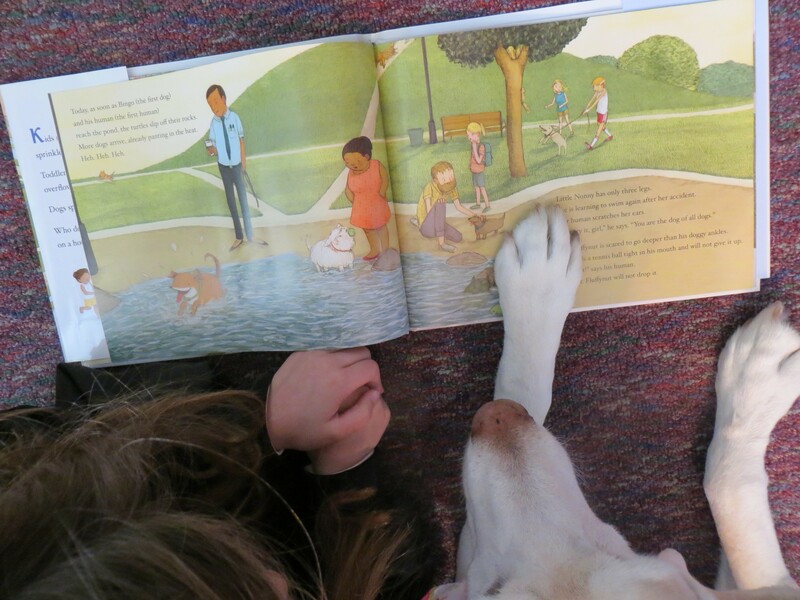 We’re all connected – people, pets, books, ideas, and on and on. I hope that you discover some connections today. 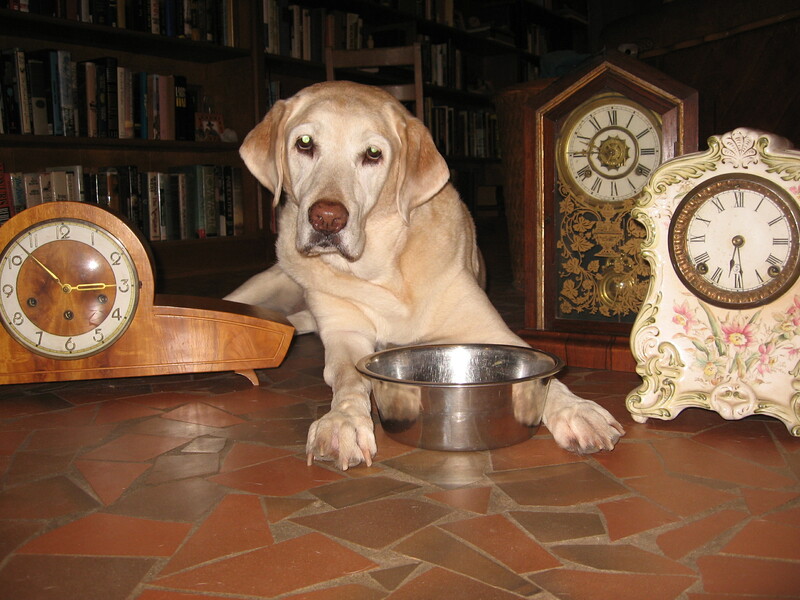 She did ramble on last night something about clocks moving backwards. Some such silly stuff. Clocks can’t go backwards! I don’t understand you humans. She says that she explains this to me every fall, but all I know is what MY clock tells me. Which is — breakfast is at 6:00 and dinner is at 5:00. So will I have to wait for dinner as well? Or will it come early? I’m so confused! I don’t understand time. I know when things are supposed to happen during my day and I try to be ready for those events. Like breakfast and dinner and going to school and going to the library and going to visit the hospital. I know what days they happen and what times. But sometimes you humans get confused! We have a great little book by Dan Harper and illustrated by that awesome guy Barry Moser and his daughter Cara. It’s called Telling Time with Big Mama Cat. Big Mama Cat knows how to tell time. And she knows when things are supposed to happen. Her day “begins at 6:00 with a big stretch.” And continues on to breakfast at 7, helping the rest of the family with various activities throughout the day and going to bed at midnight. On each page there is a clock that shows what time it is. And it even has a fold – out clock so that you can move the hands as Big Mama goes through her day. This is a most fabulous book. That Big Mama Cat is one smart kitty. And as always with Mr Moser, the illustrations are incredible. It hasn’t helped me figure out what’s going on with the clocks today. But I’m hoping things will get worked out before my dinner time. In the meantime, I’m thinking that it’s nap time. I’ll have to go check with the Mom Person and make sure. I hope you’re on time for all of your events today! 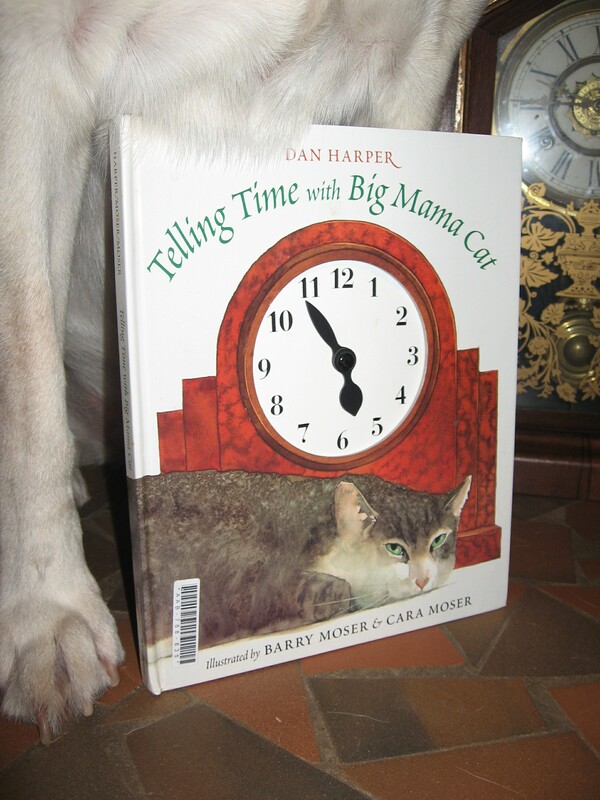 And if you have time, you might want to check out Telling Time with Big Mama Cat!